There were 559 press releases posted in the last 24 hours and 153,509 in the last 365 days. WASHINGTON DC, WASHINGTON, UNITED STATES, July 3, 2018 /EINPresswire.com/ -- These days most of the start-ups are adopting the eCommerce website builder platform to sell online and manage their online store. The website builder is one such platform that provides first-time entrepreneurs a complete e-commerce solution that lets them build, customize and run an online store without having to write a single line of code. Thus, GoodFirms has publicized a list of Best B2B Ecommerce Software with en-number of tools to help all the start-ups, small and medium-sized business to run the e-commerce website in their financial plan. Today in this innovative world, there are various types of readymade software for managing the business. The management software’s are designed specifically to save a business time, to have all the details in the systematic order and assist in handling a variety of warehouse processes to boost both profits and customer service. If you are looking out for such software, checkout at GoodFirms - there are Best Order Management Software providers and Best Warehouse Management Software systems listed from all over the worldwide. 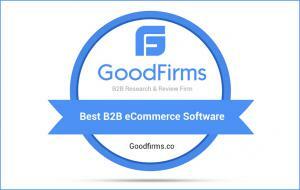 GoodFirms is a Washington, D.C. based B2B research, ratings, and reviews firm. GoodFirms compiles the top leaders in every software field through a profound assessment which holds a number of key factors including their market research, quality of work and their client reviews. However, GoodFirms research lists the most excellent software service providers, so that the entrepreneurs or individuals get associated with the reliable companies that are having a strong record of superiority work. Moreover, GoodFirms keep on researching the top technology software and encourages all the service providers to come forward and participate in the ongoing research to get indexed in the list of Best Software Management service providers to obtain more prospective customers. GoodFirms is a Washington, D.C. based research firm that aligns its efforts in identifying the most prominent and efficient B2B e-commerce software that deliver results to their clients. GoodFirms research is a confluence of new age consumer reference processes and conventional industry-wide review & rankings that help service seekers leap further and multiply their industry-wide value and credibility.